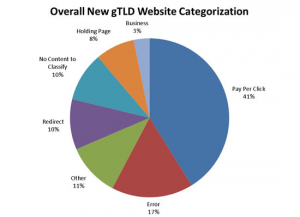 The analysis of common usage of websites, performed by Verisign, has shown that 3% of domain names registered in new gTLDs contain business websites while 41% are utilised as PPC (Pay-Per-Click) sites. The most common use of websites created under new gTLDs, according to the Verisign analysis, is Pay-Per-Click (PPC) advertising (41%), with little user-generated content. As much as 17% of those websites display information about an error, for example, due to the lack of DNS configuration, 10% is used to redirect visitors to other addresses, and the same percentage does not have content to make classification possible. 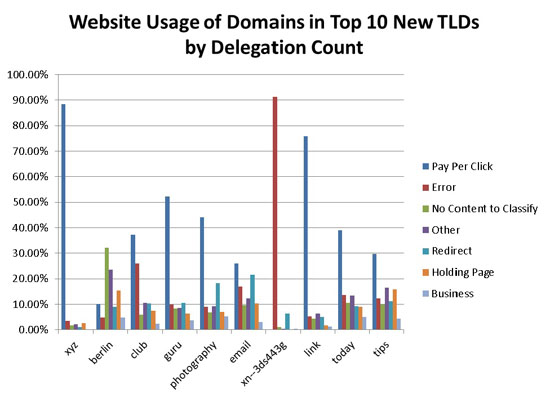 Another 8% of websites is used as holding pages, and 11% of domains were assigned to the category named “other”. The results of Verisign study seem to present new extensions in a negative light but the rivalry between the .COM registry and the new TLD operators (new entrants to the domain market) comes as no surprise. At the current stage of those registries’ development, a great number of new domain names is used for speculation, profiting from ads or redirects. Many of them were also registered in order to protect brands, and are not intended for commercial use. 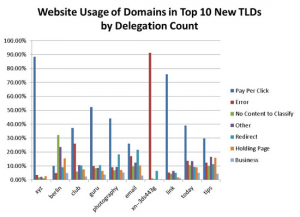 New TLDs may still have a considerable way to go before they become a solid and effective foundation for brands. However, it seems rash to stuff all new TLDs into one bag as there are some really valuable and attractive domains among them, such as geo TLDs like .BERLIN or popular names like .CLUB. Some extensions, devoted to special areas of interest or industries, such as .CLOTHING or .CONSTRUCTION, still need time to “mature” to finally reach the target audience. To register a domain name that will protect your brand or mark your unique presence online, please click on the domain of interest or enter the name you desire in our global search box. If you have questions or need assistance, please do not hesitate to contact our Support Team at support@web-solutions.eu or via phone on +44 (0) 208 133 3994.